Pick any Challenge and then a two-week period within our current quarterly Action Plan to see if you can meet the Challenge goal. 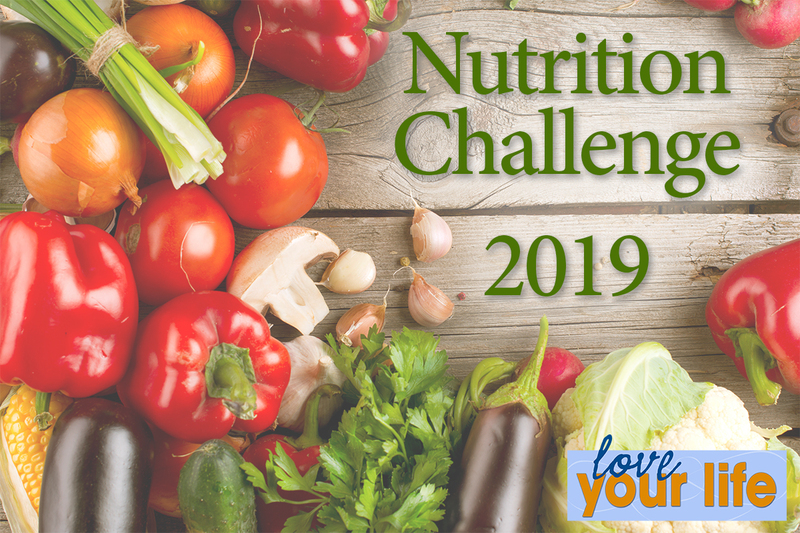 Once completed, click on the Nutrition Challenge activity at myinteractivehealth.com and fill in the form to earn 25 LYL points. You can earn up to 50 points per quarter for the Nutrition Challenges. You’ve got this! Hydrate! Hydration requirements vary according to gender, weight, activity levels, breastfeeding status, etc. But a good estimate is about 8 cups per day. As always, if you have medical conditions that require you to limit your fluid intake, speak with your provider before attempting this Challenge. Want even more hydration info? Check out the CDC’s recommendations here. Save money AND earn Love Your Life points. Pack your lunch (or dinner) and bring to work every day for 2 weeks. Think healthy: whole wheat breads, veggies, no sugar-added yogurts, fresh fruits, etc. Cutting back on your meat intake can help you consume less saturated fat and get more veggies into your diet. Excluding breakfast, eat at least 1 meat-free meal per day for 14 days. Absolutely no fried food for 14 days. Fried food can contribute to excess caloric intake, excess fat intake, and higher cholesterol (just to name a few disadvantages). There are plenty of other ways to cook your fried favorites such as baking, sautéing, braising, and broiling. Switching to 100% whole grain breads can be a simple change that makes a big difference. Whole grains are more nutrient-dense than processed grains and can assist with adding more fiber to your diet. Swap your white breads/grains for 100% whole grains for 2-weeks. Does that biscuit count? Only if it’s whole wheat biscuits. My dinner roll? Only if it’s 100% whole wheat. You get the picture. Have fun and experiment! The USDA recommends 2 cups of fruit per day for adults. In this Challenge, eat at least 1 whole fruit per day for 14 days. It’s gotta be whole fruit to count (I.e. no fruit cups, no juice). In this 2-week Challenge, we urge you to steer clear of most pre-packaged foods. Stick to whole foods (fruits, veggies, lean meats) and some packaged foods like your whole grains, eggs, and plain yogurt, dairy. Avoid chips, crackers, cookies, boxed/frozen meals, sweetened yogurts, etc. If it comes in a box or bag then try to avoid it. Pack a healthy snack every day for the next two weeks. This isn’t just an at-work Challenge either. Have a snack ready to go if you’re at your kid’s ballgame, out running errands, or on the road. Try an apple with almond butter, unsalted nuts, low-fat string cheese or any other healthy snack that strikes your fancy. Be ready with a healthy choice when the urge to hit a vending machine or grab a candy bar strikes you. Eat a healthy breakfast to start your day on the right foot. This means not smothering your oatmeal in brown sugar. Or piling cheese all over your scrambled eggs. Aim for fresh/cooked fruits, 100% whole grains, low-fat dairy, and healthy proteins. Ever kept a food journal? It’s a fantastic tool to help us realize what we are actually consuming throughout our days. It can help you be more conscious of your food choices and intake as well. For best results, be honest and record (as Weight Watchers says) “every BLT…Bite, Lick, and Taste”. This challenge is all about cutting sodium. The American Heart Association’s Salty 6 are popular foods that can add high levels of sodium to your diet. To complete this challenge omit these foods for 14 days: Breads & Rolls, Pizza, Sandwiches/Burgers, Cold Cuts & Cured Meats, Soup, and Burritos and Tacos. For more info about cutting sodium, visit the AHA website here. For this to count, the food has to be naturally green. Eat 1 cup of raw or cooked vegetables or 2 cups of raw leafy greens. We’re talking adding leafy greens to your scrambled eggs, try green smoothies or juices, salads (well…duh), adding veggies into your soup/stew/chili, or add them to your wraps and sandwiches. Have fun experimenting! It’s no secret, distractions while we eat can cause us to overeat. And when we aren’t focusing on the meal (and those around us), we tend to enjoy it less as well. For this Challenge, absolutely no screens at meal time. Yes, every meal: breakfast, lunch, and dinner. This means TV off. This means phones and tablets put away. Engage with those around you and in the meal you or someone else has prepared. Bon appetite! Don’t drink your calories. American Heart says keeping tabs on how much sugar you’re swallowing is an important part of a heart-healthy lifestyle. Cutting out sugary beverages is an easy place to start if you are working on improving your diet and trying to consume less sugar. For this challenge, not only are we talking about sodas, but also sugary sweet teas and coffees and sports drinks. Find out more by clicking here. This idea came from Eat This, Not That! Here is the challenge: If you’re feeling the slightest bit emotional and want to eat for anything other than physical hunger (think boredom, stress, loneliness, anger, or even when you feel like celebrating or feeling super awesome), try doing something else. Think of something therapeutic for you…maybe it’s calling a friend, going for a walk, petting your cat or dog, or finding a new activity to distract you. Every time you sit down to eat or grab a snack, ask yourself, “Am I physically hungry? Am I eating or wanting this for another reason?”.